Bold Statement. The writer announces to the world that they intend to spend tomorrow writing. They set themselves a target based on either word count or a number of chapters to be completed. As the writer finishes their speech they will let out a loud sigh of contentment and stare out of the window with a dreamy expression on their face. The thought of writing all day tomorrow fills them with such joy. Swift Change of Priorities. Tomorrow arrives and the writer leaps out of bed ready to spend the entire day writing. As they sit down at their writing desk and stare at a blank screen they suddenly get a powerful urge to go do something more important. Writing is no longer a priority when the garage needs clearing out, the leaves in the street need sweeping, a couple of motivational quotes need to be tweeted, the cutlery drawer tray needs rearranging and fluff in the carpet needs to be plucked out by hand. Deep Procrastination. The writer is in deep procrastination mode, whilst on their hands and knees, plucking out bits of fluff from their carpet. They might be overheard muttering “I am so glad I have the time to do this pressing job!” If a loved one enters the room and questions the writer on what they are doing they might receive a sarcastic comment, an angry glare or even a teary outburst. You see the writer knows exactly what they are doing – NOT WRITING! A writer suffers with writer guilt and admitting to their loved one that they are performing a meaningless and pointless task instead of writing would bring on a huge bout of guilt. So, its best for the writer to make out that plucking out bits of fluff from the carpet is a job that needs to be done….by hand. All the best with today’s writing! 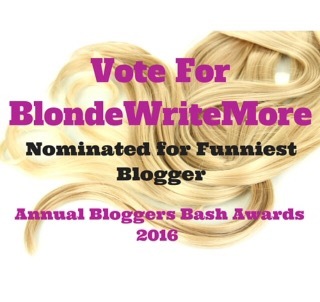 Psst..have you voted for Funniest Blogger in the ABBA awards yet? Yes me too 🙂 thx for reading and happy Thursday! I have lost count of time I’ve said I wasn’t in the mood to write. Hmmmmm me to Eric – have a fab day! I’m writing a bit now before work, your article either inspired or guilt tripped me. I hope you have a good day too. So easy to do! Sometimes that inspiration hits at a time you can’t write then when your Writing g Day looms… the spark has fizzled out! !! There are always so many other things to do, those watched items on e-bay, that James Bond JPG that needs adding to Pinterest, those recorded items that are clogging up the sky box that need deleting . . . Oh and that annoying carpet fluff! I am sure it’s amazing 🙂 I like your style 🙂 thx for reading and happy Thurs! “I’m not in the mood to write today.” I say that one all the time. Though I’ve been getting better trying not to do that! Yes I know what you mean. It’s easy to recognise once you accept that at times you are have a tendency to stray from the writing path – thx for reading and happy Thurs! Here are some accurate stages of procrastination. If I had to add a 6th, it would be that something new came out on Netflix. You’re welcome. Another good one. The surest way to guarentee my boys a sick day from school is for me to declare that I intend to take the day as a writing day. It’s like they can sense mom is feeling industrious and would be so much better putting that energy into service to them. Some of the best work I never wrote came to me during such episodes & interludes. I’ve become very good at forcing myself to write! Clears throat. Yanks out a frog. Eke. I can’t write today. I just yanked a frog out of my throat. 😀 😀 😀 Procrastination is my worst enemy. You have the excuses down pat. Hey thx Tess – happy Thursday! I can’t begin to tell you the numerous times I’ve gone through those stages of procrastination. I think a lot of my procrastination comes from a lack of confidence in myself and my writing. Sometimes I get stuck on a piece and have no solution to write out of it. So, the latter stages hit me hard. So, I will try to not procrastinate and just get those ideas out there. The biggest problem I see here is the word, “tomorrow”. That’s what gets all of us. Don’t put off tomorrow what you can put off today. Yay go Tina Meyer 🙂 Happy Sunday! Monday here – start of the working week! Enjoy your day! And thank you – your posts are always awesome! I don’t tell you that enough. Great post, Lucy! And when you have depression, that certainly feeds into the procrastination mood (and probably vice-versa, too). My biggest thing that is a hurdle is that I’ve had to learn to write even when I don’t feel “inspired.” I think that writing’s like life in that regard: you can’t wait until the “perfect moment” to buy the house, enter college, start a family, get married, etc., because you might wait for a day that never, ever comes. Sometimes, you do really just have to go through the motions (‘fake it til you make it’ I think they say in therapy sometimes!). Yes!!! Me too! Great comment! !